October 2018: WGND Annual Meeting The Hague. M. tuberculosis MIC H37Rv < 0.1 uM. TB clinical isolates MIC90 = 0.1 uM. Cidal in vivo TB models at 0.5 mg/kg. Expected therapeutic dose <15 mg q.d. Phase 2a to start 2Q2019. Combination therapy 656+BDQ+Pa reduces relapse in mice (Johns Hopkins Medicine). June 2018: Phase 2a EBA study in South Africa is planned NCT03557281. This study will investigate the early bactericidal activity, safety and tolerability of GSK3036656 in up to four sequential cohorts of subjects with rifampicin-susceptible tuberculosis. The primary objective of this dose-escalation study is to establish the anti-tuberculosis effect of GSK3036656 on serial colony forming units (CFU) counts of MTB in sputum over 14 days of therapy. Subjects in each cohort will be randomized in 3:1 ratio to one of two treatments: either GSK3036656 or standard-of-care (RIFAFOUR® e-275) regimen. The approximate duration of the study for an individual subject will be 5 weeks, including 1 week of screening, 2 weeks of treatment period and another 2 weeks of final follow-up visit. RIFAFOUR e-275 is a registered trademark of Sanofi-Aventis. GSK070 has in vivo antitubercular activity with demonstrated efficacy in the standard acute and chronic murine assays, and when it was administered combination with new antitubercular drugs is more active than standard of care. Background: Leucyl-tRNA synthetase (LeuRS) is an essential enzyme for protein synthesis. LeuRS has two catalytic sites, an aminoacylation site, which charges tRNALeu with leucine and an editing or proof-reading site that hydrolyses incorrectly charged tRNALeu. Application of the oxaborole tRNA trapping (OBORT) mechanism (Rock & Mao et al. Science, 2007, 316: 1759) to M. tuberculosis (Mtb) LeuRS lead to the discovery of GSK070, which is in development for tuberculosis treatment. Material/methods: Enzyme and cell-based structure-activity relationships (SAR) were used to optimize potency. The LeuRS IC50 values were measured using the aminoacylation assay. The nosocomial pathogen MIC values were determined by CLSI M7-A10 and the M. tuberculosis H37Rv MIC values were determined using resazurin. Inhibition of human cell protein synthesis was determined in HepG2 cells. 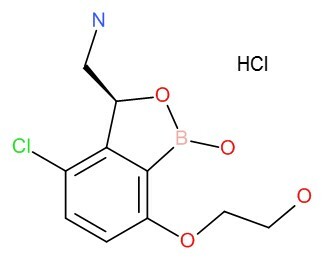 Results: We designed and synthesized a series of LeuRS inhibitors by introducing various substituents onto the aromatic ring of the 3-aminomethyl benzoxaborole scaffold. A number of compounds were identified, which showed good antitubercular activity with high selectivity over human cytoplasmic protein synthesis inhibition. Further evaluation of these Mtb LeuRS inhibitors led to the discovery of GSK070, which exhibits potent inhibition of Mtb LeuRS (IC50 = 0.216 μM) and antitubercular activity (Mtb H37Rv MIC = 0.08 μM). Additionally, it is highly specific for the Mtb LeuRS enzyme, as the IC50 for human cytoplasmic LeuRS is 140 μM. Conclusions: GSK070, selected as preclinical candidate, is a new antitubercular agent that targets Mtb LeuRS, a novel protein synthesis target for tuberculosis.